Despite the weak legal marketplace, lateral hiring of lawyers at large firms is at record highs. 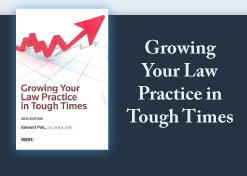 A primary reason is that firms want to buy a book of ready-made business that will come with the lawyer to his or her new firm. How much new business? I have heard anecdotal evidence suggesting that firms which used to expect a $1 million book now virtually double that expectation for new partner hires. Certainly the firm making a lateral hiring decision may not believe it will actually get all of such an amount, but reasons that if the bar is set high enough it might get somewhere close to such an expectation. Also, lateral hires are normally lawyers who work with larger clients whose substantial legal spending often goes with the lawyer they know. A related concern is how well the lateral hire has communicated with existing clients, particularly with regard to their opportunities to go with the departing lawyer or stay with the existing firm. Without clear communication, clients may well engage a second law firm, just to make sure they are not left hanging in the wind with the same uncertainty in the future. An even more difficult scenario is when the departing lateral hire and the former law firm compete for the business of the client. Firms often may not be willing to compromise on the issue of whether clients belong to the firm or to the lawyer, and may well have groomed another lawyer to step in to represent the client. Such a firm may well press its advantage and retain the business, despite the departing lateral's assurances to the new firm that the business is coming. Here, again, it's possible that the client will ignore the lawyer, the old law firm and the new law firm, going to yet a different firm with its business. And if the clients don't come, how happy will the marriage of new firm and lawyer be? We've already written about the Texas law firm that was successfully sued by a lateral hire partner who felt the new firm misrepresented its prospects. A more likely potential problem is that lawyers who change firms tend to be driven by both the urge to excel and the related urge to make more money. But such lawyers may not know when to stop, and keep moving from firm to firm in order to come out on top and in control. All of which argues for making a lateral hiring decision with eyes wide open and expectations clear on all sides. I'm enjoying the uniqueness that is Costa Rica. There is much beauty and civility here, enough to want to return many times. I'll be back next week and will pick up new projects and adventures that I will enjoy. In this time of the new year, let me echo in a different way what I said last week: Do you have a plan or set of goals for 2011? Are you still working on plans you created previously but have yet to complete? How are your plans going? As the new year begins, are you sitting around, waiting for things to happen? If yes, why? Do SOMETHING, anything that will move you forward. Don't wait another year to achieve your goals, you'll just be one year older. Break out and start down the path to reach your goals.